The first appearance for thirty years of a Dundee club in a major final prompted a considerable number of Dundee supporters to travel to this game. 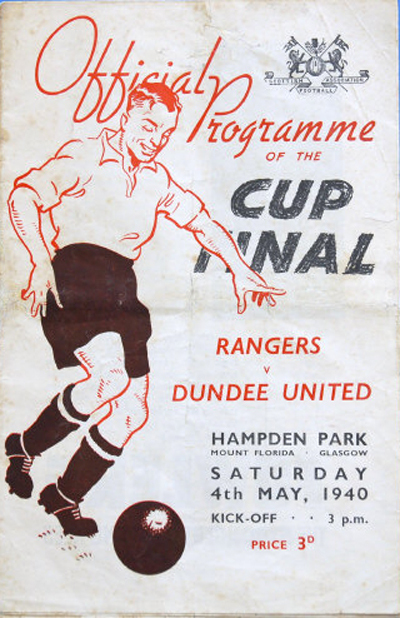 United's opponents in their first cup final were Rangers. The crowd was officially restricted to 75,000 but many more than that number had already entered Hampden, resulting in the gates having to be closed. The shoulder injury which had kept captain Jerry Kerr out of the semifinal had not healed, so he missed out. The majority of the crowd expected United to lose, but manager Jimmy Allan had prepared the team well. Mid-way through the first half United appeared to have made the breakthrough their play deserved. A free-kick taken by Arthur Baxter hit a defender; Tommy Adamson raced forward and lashed the ball past Dawson. As United's players and supporters celebrated, and Rangers' players began to move upfield for the re-start the referee called it Offside. United refused to be deflated by their poor luck. They continued to press forward into the second half, but all the while Rangers were growing ominously stronger and more forceful. The inevitable happened after 75 minutes, as Rangers centre-forward Jimmy Smith for once escaped the attentions of Littlejohn, who had not put a foot wrong. On this occasion Jimmy Smith eluded his shadow then sent goalkeeper Charlie Thomson the wrong way to score what proved to be the only goal of the game.